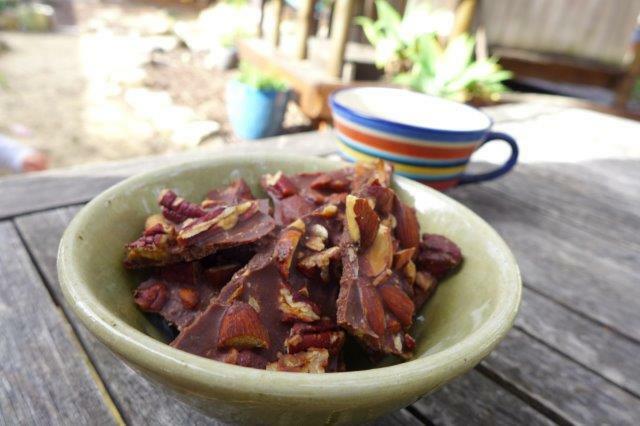 ¾ cup almonds, pecans or a selection of your favourite nuts..pre roasted and chopped. Add a little stevia to your taste and stir. Mix in desiccated coconut and nuts. Line a baking tray (one that will fit in your fridge easily). Pour mixture onto tray making sure to evenly spread all the ingredients throughout. Put in fridge for half an hour..or in the freezer for a delicious melt in your mouth superfood snack. You can add any ingredients to the mix, goji berries, macadamias, dried apricots, cacao nibs, peppermint oil..even some fresh chopped herbs!